Today’s ‘Reel’ Wedding is of Danny and Hayley which took place in the beautiful countryside of Prestbury at Hilltop Country House. It was a gorgeous sunny day and a fabulous wedding full of fun and laughter, as well as a few competitive games of garden Jenga! 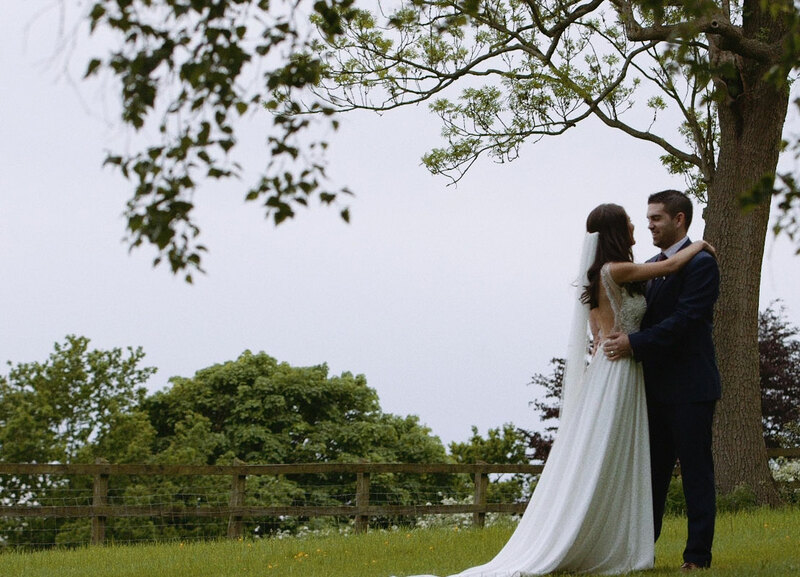 We loved providing wedding videography for Danny and Hayley and wish them the very best for their future together. Here is their story..
“The dress was the hardest thing to choose. I knew in my head what I wanted however finding the real thing proved incredibly hard. Having gone to several shops I ended up finding the dress in the first shop I had ever been in. The back of the dress was what I fell in love with. I never wanted a dress with so much detail on the body, however when I tried it on everything just worked. I felt it had the perfect combination of detail and simplicity, which is what I had always wanted. It was my dream dress and I felt so special on our wedding day. We always knew that we wanted a laid back wedding and therefore Tops and Tails were not an option for us. Having decided on the bridesmaid dresses we then chose electric blue, which complemented the dresses wonderfully. Having searched the Internet for several weeks and making numerous appointments at different venues we found ‘Hilltop Country House’ and instantly fell in love. From the second we arrived, the beauty of the venue and its surrounding grounds blew us away. The owners welcomed us in as if we were their family. Once we had visited Hilltop we knew this was the one. We cancelled all our prospective appointments and never looked back. From the moment we found the venue the family couldn’t do enough for us. They were always at the other end of an email and encouraged us to come and see the house as often as we wished and each time we went up we fell in love with it a little more. Our colour scheme came from the venue; our aim was to bring the outdoors inside, with rustic undertones and wild flowers. The house is covered with purple wisteria so this formed the basis of part of the colour scheme. Hayley made most of the table decorations that added a personal touch to the day. Throughout the year, china cups and saucers were collected to decorate the marquee, and on the day these were filled with wild flowers. All our boards and table plans were made by the amazing Nat at ‘My Rustic Wedding.’ She worked with us to tie each of the boards into our venue and theme. Wild flowers were chosen for bouquet and table flowers. Purple was the main colour, however we didn’t want just one key colour so Laura, our florist chose colours that complimented the gardens and also the bridesmaid dresses. The bridesmaids had baby’s breath for their bouquets and this was also used on the aisle for the wedding ceremony. The bridesmaids chose their dresses themselves. They all knew what they wanted and this made it a lot easier for us as all our bridesmaids were happy. The colour was a beautiful mauve colour and the girls looked beautiful on the day. The part that we were dreading about the day was the ceremony, all eyes on us as we said our vows! We decided that we wanted the ceremony to be short and sweet so that we could enjoy our day with our guests. We were lucky enough on the day to have perfect weather and be able to celebrate our wedding outside, surrounded by blue skies… and the odd wasp stinging the guests! For our entertainment during the day, Hayley’s love for the piano led us to Liz Hendry, whom we met at a wedding fair in Bolton. Once she played our wedding song to us there, there was no one else we would have wanted. Her playing gave the day a laid back tempo, and she was wonderful throughout the ceremony and the meal. In terms of food, Pies took centre stage at our wedding. It was important to us that everyone felt full and we thought that pies were a great way to keep everyone happy and also tied in delightfully with the rustic feel to the wedding. For the main meal we decided on a hog roast buffet. Again this meant that our guests could eat as much as they wanted. Suzanne at ‘The Frostery’ made our cake. This was Dan’s favourite part. She helped us every step of the way and created the most wonderful cake, which tied in with our theme. Our Photographer was Pixies in the Cellar. We couldn’t have asked any more from our photographer. Having visited us before the wedding they were able to create the most wonderful pictures that followed our theme. Throughout the day they were discrete and allowed us to enjoy our day and captured natural moments as we had asked.